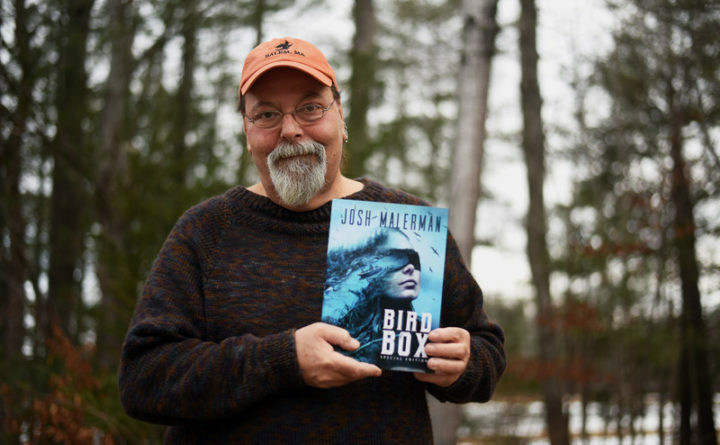 Newcastle artist Glenn Chadbourne holds a special edition of the book "Bird Box" by Josh Malerman, which he illustrated. A Netflix movie based on the book has become the streaming service's most-watched original film ever. The 2014 book by Josh Malerman follows a blindfolded mother and two children through a world where an unknown presence drives those who see it to take their own lives. The film adaptation was watched more in its first week than any other original film from Netflix. Dark Regions Press LLC asked Chadbourne to illustrate a special edition of the book, which was released in 2018. The special edition features a wraparound color dust jacket with artwork by Vincent Chong, 10 interior illustrations by Chadbourne, a new 9,000-word “Bird Box” story entitled “Bobby Knocks,” and a new afterword from the author. There were 526 copies of the special edition printed. It took Chadbourne around two months to draw the illustrations that appear throughout the book, which feature scenes now associated with the film, of a blindfolded woman navigating a rowboat along a dangerous river. Netflix released the film Dec. 21. According to a tweet by Netflix Film, more than 45 million accounts watched the film within the first seven days of its release. Chadbourne said that while specific aspects of the book were changed for the adaptation, the film stayed loyal to the storyline overall. He said he thought the casting was well-done and that the imagery of the film matched his imaginings of the post-apocalyptic world in the book. “It’s like they plopped the images right out of my head,” he said.